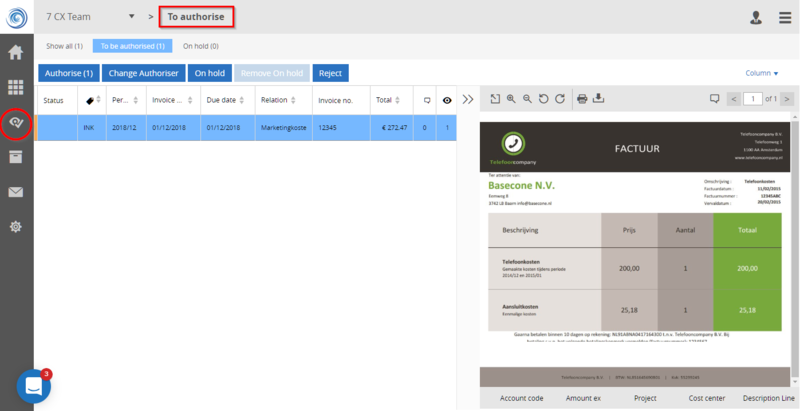 When you have invoices to be authorised after booking, you can find the documents in the “Authorisation” screen. You can manually select “Authorisation” on the top right menu or click on the eye-icon with a check mark on the left menu. When you are on the right screen, you will see the name of the company and To authorise on top of the screen (see image below). On the upper left side of the page via the drop-down ▼ menu, you can view the selected company. By clicking on the drop-down menu, it is possible to switch and select another company. - The authoriser can re-assign the document to another authoriser. Before this can be changed, a mandatory comment needs to be stated. This action is used to reject a document. Before the document can be rejected, it is mandatory to add a comment. If there is another authoriser assigned to the document after, the authorisation process will stop here. The next authoriser will not see the document anymore for authorisation. The rejected document will be visible in the rejectbox and can only be managed by the administrator. Tip: press the button Ctrl or Shift on your keyboard to select multiple lines. 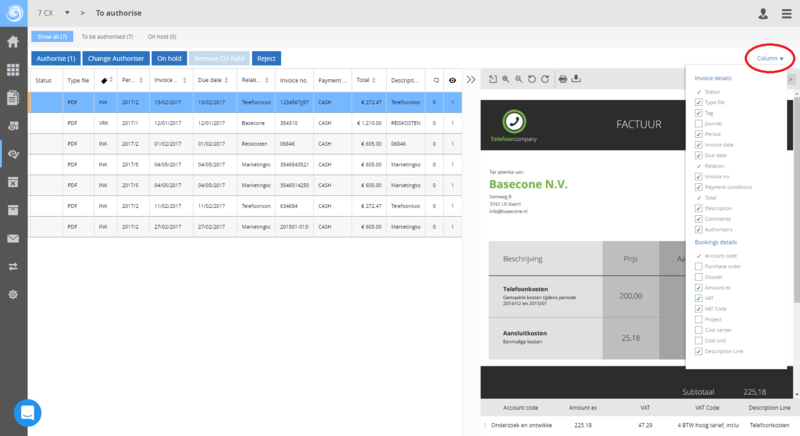 Then you can easily authorise multiple invoice in one-go. Click on the function "Column" on the top right to view, select and save columns you would like to see in the authorisation screen. The status, relation, total, account code columns are selected by default. It is possible to select more columns if needed. Click on "Column" to save the columns. 📌 The selected columns are saved on a browser level, not per user settings. This means that if you log in with the same user on the same computer and browser, the columns are saved. If you use another browser or log in to another computer, you will need to re-apply and save the columns.